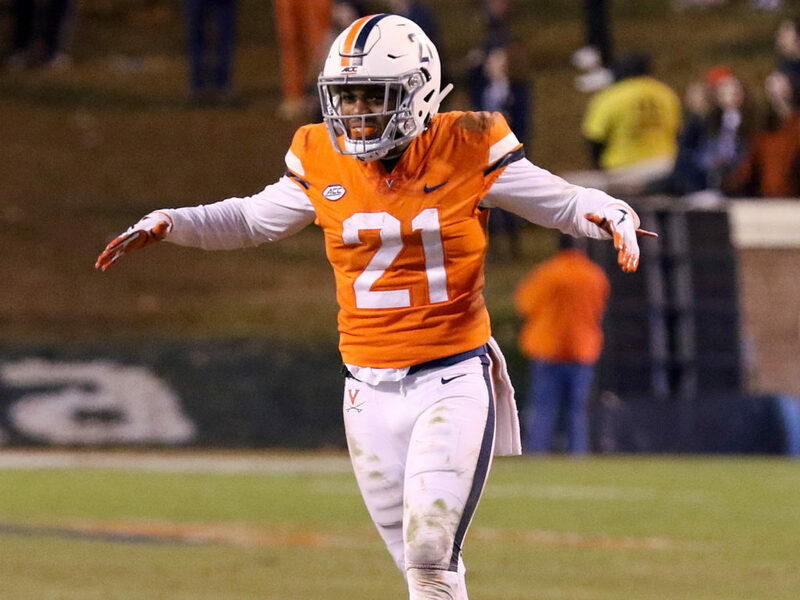 Senior wide receiver Olamide Zaccheaus, junior cornerback Bryce Hall and senior safety Juan Thornhill headline the University of Virginia football players who were recognized as 2018 All-ACC performers by a voting panel of 46 media members and all 14 ACC head coaches. Zaccheaus, Hall and Thornhill each earned first-team honors. Meanwhile, senior linebacker Chris Peace (third-team), junior receiver/returner Joe Reed (third-team specialist), junior quarterback Bryce Perkins (honorable mention), senior running back Jordan Ellis (honorable mention) and senior tight end Evan Butts (honorable mention) were recognized as well. Zaccheaus, UVA’s all-time receptions leader, finished second in voting points at the wide receiver position with 158, six behind NC State standout Kelvin Harmon. Hall was second in points at cornerback, 20 behind Boston College junior Hamp Cheevers, while Thornhill finished first in safety voting with 123 points. The Atlantic Division champion Clemson Tigers, who will face Coastal Division winner Pittsburgh for the 2018 ACC Championship this weekend, led all teams with 18 players on the first, second and third teams. Boston College was next with 11. Click here to view the complete breakdown of the 2018 All-ACC team. Hollins’ two touchdown runs (six and 43 yards) boosted University Lab (Baton Rouge, LA) to a 14-0 lead over De La Salle six minutes into the Division II semifinals. The Cubs rolled to a 43-14 victory and a berth in the Division II championship game against St. Thomas More on December 7. NOLA.com/The Times-Picayune writer Andrew Scherer wrote that Hollins was “near unstoppable” against De La Salle. The future Cavalier totaled 121 yards rushing on 11 carries and had two receptions for another 22 yards. Goddard hauled in a touchdown pass in helping Greeneville (TN) to a 43-8 win over Maplewood in the Class 4A semifinals. The Greene Devils (14-0) will take on Haywood in the state championship game on Thursday. Terry hauled in a 31-yard touchdown pass and ran for two more scores to lead Blacksburg (VA) to victory in the Class 4, Region D championship against E.C. Glass. The 5’9” senior finished with 92 yards rushing and 38 yards receiving for the Bruins, who will face Woodgrove in the Class 4 state semifinals on December 1. Four weeks and one day from today (November 27), FBS high school senior recruits will be able to sign letters of intent with their respective schools. The FBS Early Signing Period begins Wednesday, December 19, and runs through Friday, December 21. UVA currently boasts 22 commitments in its class of 2019. Checking in on the 2018-19 recruiting calendar, we are now in a Contact Period that began on November 25 and ends February 2, 2019. During this time, college coaches can make in-home and in-school visits with recruits and host recruits on visits. A Dead Period begins December 17 and lasts until January 10, however, and only phone/social media/e-mail contact is allowed during this time.